NEWPORT, Ark. — The tropical depression that was Hurricane Harvey left its footprints on Arkansas, flattening acres of harvest-ready rice, corn and soybeans, and perhaps setting the stage for a mosquito boom. 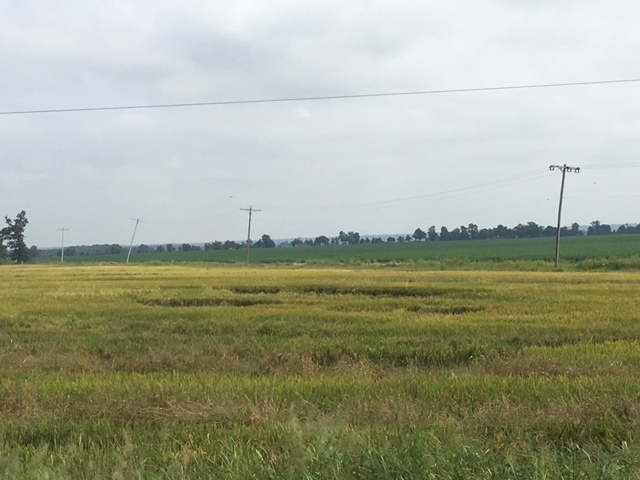 RICE -- Rice field in Poinsett Co., Arkansas, showing "potholes" where Harvey's wind and rain pushed down stalks. "A few corners of rice fields are starting to lodge, and some of the more rank beans are beginning to lodge as well. The lower ends of the bean fields that don't drain quickly will be partially lost and it will be worse where levees were just pulled and irrigation started this week. Harvest will obviously be delayed in much of the rice and corn, where combines were really cranking up this week," said Poinsett County Extension Agent Justin Chlapecka. (U of A System Division of Agriculture photo by Justin Chlapecka). “Late season storms with driving wind and rain aren't beneficial this time of year,” Matthew Davis, Jackson County extension agent with the University of Arkansas System Division of Agriculture, said on Friday. McGee and others were particularly worried about soybeans. Jeremy Ross, extension soybean agronomist for the Division of Agriculture said that most of Arkansas’ soybeans are either in the filling pod or maturing stage, which means they have the maximum number of leaves and pods. With Harvey’s arrival, his phone has been blowing up with calls about lodging – where wind and rain cause the plants to lean or fall flat to the ground – and flooding. He said that with lodged plants, “seed sprouting and pod decay is increased due to excessive moisture within the canopy due to restricted air movement. “Also, insecticides and fungicides are less effective in lodged field because they will not penetrate as deep into the crop canopy as they would with standing plants,” Ross said. There are “going to be a lot of mudded fields when they go back to cutting because the heavier soil won't be dry enough when the fields get ready to cut again,” ‘he said. In some areas, roads were closed by water. Since harvesters are built to catch plants that are standing upright, crops at the wrong angle or flattened will be missed. Photos taken by extension agents through the Arkansas Delta on Thursday and Friday showed many acres of flattened rice, though in many cases it was in field corners where seeding and fertilizing runs tend to overlap from different directions. Robert Goodson, Phillips County extension agent for the Division of Agriculture, estimated 1,000-2,000 acres of mature rice were knocked over near Marvell. He also said there was some lint loss in cotton in his county and in some cases, wind on the heavy bolls caused the plants to twist. That, Goodson said, could slow harvest. Bill Robertson, extension cotton agronomist for the Division of Agriculture, said Harvey would be tougher on early cotton. As a whole, “we just need sunshine,” he said. Jason Kelley, extension wheat and feed grains agronomist for the Division of Agriculture said that “this was not what corn farmers needed. We were making good progress on harvest before Harvey arrived. “An estimated 50 percent of the state’s corn has been harvested and yields have been above early-season expectations,” he said. “The biggest issue we will face now is lodged corn from the winds and rain. Most of the corn has been ready to harvest for some time, but previous rains delayed harvest. “The longer corn stands in the field waiting on harvest, the greater the chance of lodging. We were already seeing some lodging issues before Harvey, so assessment is still ongoing, but some areas will likely see significant lodging,” he said. Grain sorghum is in the same boat, he said, with about half or more being harvested. He expected some lodging in sorghum, but also sprouting grain, thanks to the rain and warm temperatures. The high moisture could also encourage disease development in maturing crops. The 2.5 inches that fell in Calhoun County was just right for fall gardens since it fell over 48 hours and wasn’t a torrential downpour, said Jaret Rushing, county extension staff chair. “Folks were smart enough not to cut and lay hay out to dry, so it’s just a matter of letting the ground dry a little,” he said. The rain might also produce a bumper crop of buzzing bloodsuckers, he said.